Keeping your beverages cold or perishable food fresh while car camping isn’t really all that difficult at all. You simply throw all of the things you need into a cooler, pack it with ice, and head out to your campsite. But what if you’re actually hiking further into the backcountry, where lugging a heavy chest simply isn’t an option? That’s where IceMule Coolers come in handy. These softsided, insulated backpacks, bags, and containers are specifically designed for use on the go, giving us the ability to conveniently carry our favorite foods and drinks with us just about anywhere. We first told you about IceMule back in the spring of 2015, when the products were relatively new to the marketplace. But more recently we managed to get our hands on one of the coolers, and put it to the test. 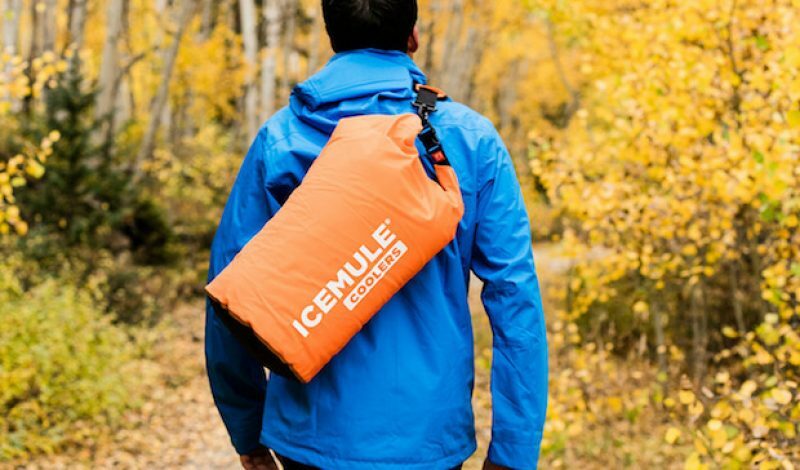 Curious to see if it could live up to the hype, we took our IceMule on a few excursions both around town and on the trail, and the results were surprisingly great. Considering the fact that IceMule promises the “portability of a backpack and the perofrmance of a hard cooler” that’s saying something. The IceMule product that was used in our testing was the size medium Classic. 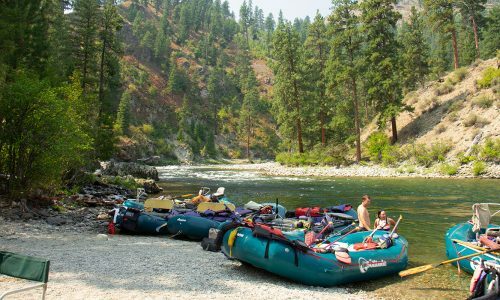 This particular cooler somewhat resembles a drybag used by paddlers and is designed to hold 12 – 12 ounce cans, or 5 bottles of wine, with enough room left over for ice as well. Depending on the size of your group, or the length of your outing, that ought to be enough to keep you well lubricated for awhile. If not however, you can always jump up to the larger version of the Classic, which is spacious enough to carry six additional cans. As with other soft coolers, IceMule uses thick fabrics and a layer of insulation to help keep the interior of the cooler as cold as possible. In this case, those fabrics include the proprietary MuleSkinEV, which is used on both the interior and exterior to add durability and a level of protection to the contents of the bag. Sandwiched in between those layers of fabric is the PolarLayer insulator, which is said to keep drinks cold for up to 24 hours. I can’t attest to that level of performance, but I can tell you that when the TriFold DriTop lid is closed properly, this cooler had absolutely no problem keeping my beverages well chilled for as long as 12-13 hours, at which time I ran out of drinks rather than ice. Additionally, the IceMule Classic also features a valve that allows air to be added or removed to the insulation layer to help keep the interior colder over longer periods of time. The more air that is injected into that layer, the longer it can maintain a colder temperature. Of course, if you have the interior of the cooler extremely full, the amount of air that can be pumped in will be somewhat limited. The beauty of the valve though is that you can add air throughout the day as the coole empties, in a sense incresing your insulation over time. Speaking of filling up this cooler, I have to point out that it takes a bit of practice to learn exactly how to pack it properly, and learn how much ice it can actually hold. On more than one occasion I found myself removing excess ice in order to close the all-important lid completely. After using the Classic a time or two, this wasn’t as much of a problem however, but it is something to be aware of in the beginning. Put to the test in the field, the IceMule Classic more than lived up to my expectations. It is extremely lightweight, but still incredibly durable, and its interior can hold quite a bit of cargo. Additionally, its shoulder strap makes it very easy to carry, even when completely filled to the brim. And at the end of the day, the entire back flattens out nicely, making it far easier to store than a traditional hard-sided cooler. For $59.95, I found the Classic to be a great option for carrying a few cold drinks or fresh foods with you on a camping trip. Going beyond that, it also works well for use at festivals, concerts, and athletic events too, making it extremely convenient to carry chilled food and beverags with you everywhere you go. I really appreciated the versatility that this product afforded me, and chances are you will be too. Durable enough for the backcountry, but easy to use just about anywhere else, this is an affordable, fun product that any outdoor enthusiast is sure to love. Learn more about this cooler and the entire line of IceMule products at IceMuleCooler.com.